Let's face it. The kitchen is not always the most design-friendly space in the home. There are spots that are less conducive to amazing design—bathrooms and laundry rooms spring to mind—but the kitchen can also present something of a challenge. While there's always new countertops and amazing new appliances, the kitchen remains, for the most part, a space dominated by its function more than by fashion. But for all of its stylistic reticence, the kitchen does provide us with one design ally. Best of all, if properly used, this ally will not only look great on its own, it will provide the backdrop to take all of the rest of your kitchen decor to the next level. That ally, of course, is the backsplash. The backsplash is one of the best places in the kitchen to invest color, pattern and even texture into the space. Whether the style is subway tile or geometric, colorful or subdued, the variations—and the possibilities—are endless. So whether you like things soft and simple or loud and proud, we've got a backsplash style that you'll adore. Here are a few of our favorite ways to spruce up the kitchen with its best design feature. Color and pattern are two of the major elements of any room, and your backsplash is the best place in your kitchen to engage in both. But if you don't want to overwhelm the room, your backsplash can be a subtle help instead of an eye-catching scene stealer. If your kitchen is mostly light neutrals, use a similarly light color that will pop against the neutral backdrop without going overboard. Neutral spaces have a calm and meditative feel, but the eye still needs something to engage. A simple patterned backsplash can be all it takes to bring a little visual energy to your kitchen. On the other end of the playing field is a strong color palette where bold tones play off of each other. In this instance, the relationship between the colors is enhanced by the dichotomy of the patterned backsplash and the solid cabinet. This interchange of patterns and solids helps to create a rich visual landscape that will make your kitchen stand out. Most of the pattern in a backsplash comes from the way the tiles fit together. There's any number of shapes and sizes to choose from, so get creative to design a style you'll love. Here the pattern of the vertically placed tiles is made even more fetching by their range of colors. Colors with greater distinction help to create more striking patterns. Here the juxtaposition of metallic and gray tiles creates an abstract pattern that gives greater character to the backsplash and, by extension, the surrounding kitchen as well. One of the best ways to blend your backsplash seamlessly with the look of the rest of your kitchen is to simply extend it. Marble is a longtime favorite for backsplashes and kitchen counters, so using it for both surfaces is an easy choice for creating a beautiful, unified look. And if you're feeling really creative, take a tip from this space with a marble oven hood. Though they're not talked about as often as colors and patterns, textures play a big role in how rooms look to us and how we feel about them. The rules in the kitchen are no different and, in fact, the kitchen gives you a lot more opportunity to play with different surface types than some other rooms. 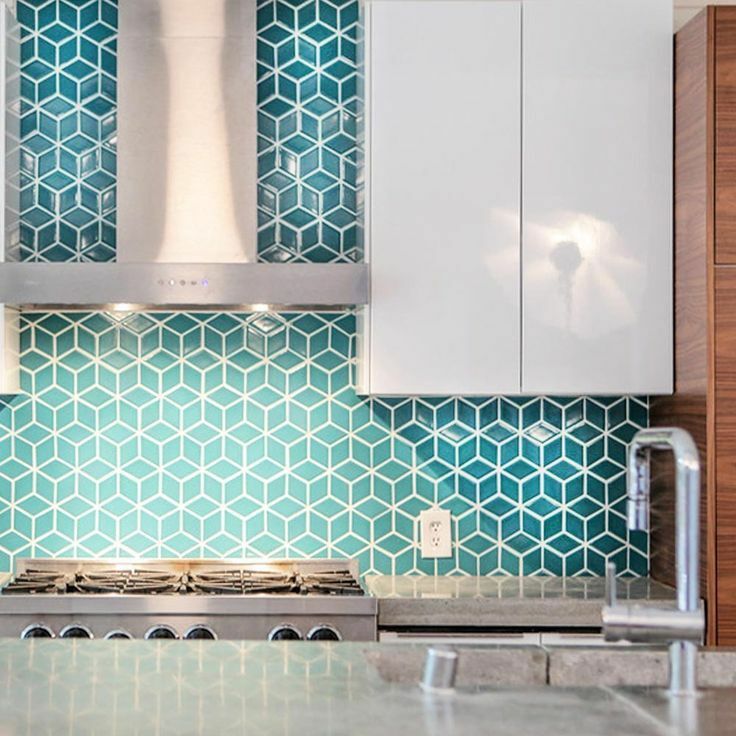 By partnering this hexagonal tile with the smooth countertop and wooden cabinets, this kitchen is giving us three different textures to complement the parts that each surface plays in the color story of the room. Kitchens are sparse by nature, so if you can get some of your elements to do double duty on the design side you'll be ahead of the game when it comes to creating a kitchen with a memorable look. Solid panel backsplashes are another growing trend that lets you keep a smooth, modern look in your kitchen. To keep the interest level high in the absence of pattern, look for colors that make a bold statement in the context of your kitchen color palette. The secret to making the best use out of your backsplash is realizing that it's never just about the backsplash. Instead, it's about how the backsplash interacts with everything else in the room. This kitchen's ultra-modern aesthetic is coming from a number of places. The geometric cube pattern of the backsplash is a wonderful starting point, and it's complemented by the smooth, clean lines of the table and chairs. The artistic light fixture is the final piece, all brought together by a moody color palette that completes the look. Keeping things simple and subtle with your backsplash doesn't mean that you won't catch more than a few eyes. This might look like an ordinary white backsplash, but look again. The tiles are laid out in a brick-style chevron patten. Coupled with some slight variations in the shade of the different tiles, this backsplash is adding some very low-key drama to this kitchen. On the other hand, if low-key isn't the note you're looking to strike, give your kitchen a bit of extra bling with a counter to ceiling backsplash in an eye-catching metallic sheen. 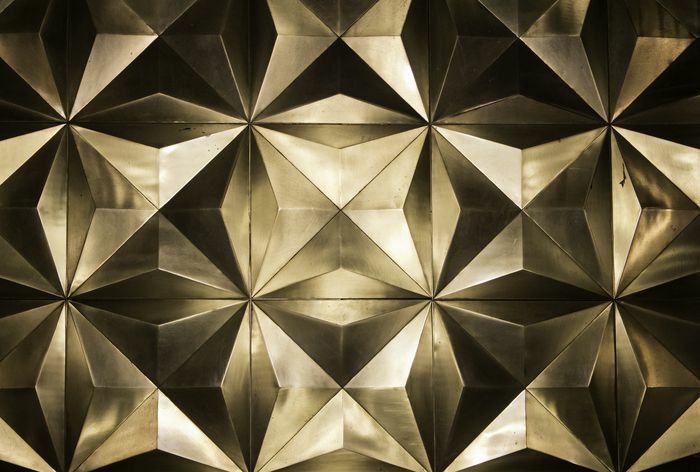 From faucets and fixtures to ovens and refrigerators, metallics are a mainstay of kitchens everywhere. This massive backsplash brings a shimmer to the entire space, taking an otherwise basic kitchen space and turning into something to talk about. Another great way to blend your backsplash with the rest of your kitchen decor is to work with a motif that incorporates a common design element. In this space, the geometric tile design that comprises the backsplash is repeated beneath the bar. Even better, the bar stools give us another burst of the same pattern. Finding clever ways to layer concepts throughout your space is part of the fun of design and makes the spaces you create even more intriguing.